148 pages | 20 B/W Illus. Classroom discussion is a concept familiar across the field of education and is often employed to support students’ comprehension of text. 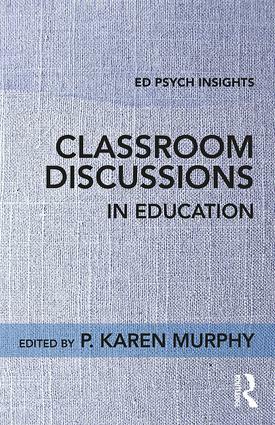 Edited by a leading expert on classroom discussion, this book situates the topic within the broader context of educational psychology research and theory and brings it to a wider audience. Five chapters describe in detail the different approaches to discussion and provide recommendations for best practices and curricular materials for student success. This concise volume is designed for anyeducation course that includes discussion in the curriculum and is indispensible for student researchers and both pre- and in-service teachers alike. "This edited volume provides a comprehensive examination of classroom talk from both the student and teacher perspectives. The book will be highly beneficial for academics that want to learn more about classroom discourse and for pre- and in-service teachers. The depth of the treatment of the topic includes theoretical and some empirical works to satisfy an academic audience, while the use of specific examples will help those not versed in the theoretical or empirical perspectives to apply what is in this volume to their classroom practice. This is particularly helpful in Chapter 4, where specific examples are given across academic domains, and in Chapter 5, where broader principles about quality talk are discussed." "At the core of all classroom instruction are discussions—the academic talk that occurs between teachers and their students. But what distinguishes good discussions that promote students’ thinking and learning from less effective ones? That is the critical question that this volume edited by P. Karen Murphy sets out to address. With each chapter, contributing authors share guiding principles for how quality discussions should be orchestrated and the learning and motivational benefits to be accrued from those discussions by teachers and students alike. Those principles, and the illustrative cases that accompany them, put the ideal of quality classroom discussion within the reach of all educators. Given the theoretical importance and practical richness of this volume, it belongs on the must-read list for anyone concerned with improving students learning." P. Karen Murphy is Professor of Education and Harry and Marion Eberly Faculty Fellow in the Department of Educational Psychology, Counseling, and Special Education at The Pennsylvania State University, USA.